Àwọn Ìdíje Òlímpíkì Ìgbà Oru 2004, lonibise bi Awon Idije Olimpiadi 28k, je idije pataki akariaye oniere-idaraya pupo to waye ni Athens, Greece lati August 13 de August 29, 2004 pelu motto Welcome Home. Awon elere-idaraya 10,625 ni won kopa nibe, eyi fi 600 ju iye ti won reti lo, awonn wonyi je titele leyin pelu awon osise egbe 5,501 lati orile-ede 201. Idije 301 fun eso waye ninu awon ere-idaraya 28. Athens odun 2004 ni igba akoko lati igba Awon Idije Olimpiki Igba Oru 1996 ti gbogbo awo orile-ede ti won ni Igbimo Olorile-ede Olimpiki kopa. Bakanna o tun je igba akoko lati odun 1896 (leyin Idije 1906 to ti je riresile latigba na) ti awon Idije Olimpiki waye ni Girisi. Athens je yiyan gegebi ilu agbalejo ninu Ipade 106k IOC to waye ni Lausanne ni September 5, 1997. Athens ti kuna idu re lodun meje seyin ni September 18, 1990 ninu Ipade 96k IOC ni Tokyo lati gbalejo Awon Idije Igba Oru 1996 eyi to sele ni Atlanta. abe idari Gianna Angelopoulos-Daskalaki, Athens mura fun idu miran, nigba yi fun eto lati gbalejo Awon Idije Igba Oru 2004. Iyorisirere ilu Athens lati gba awon Idije 2004 da lori ibebe Athens si itan Olimpiki ati itenu re mo ipa pataki ti orile-ede Girisi ati ilu Athens le ko nipa pipolongo iwa Olimpiki ati Isunkankan Olimpiki. Bakanna, ko ri bi idu won fun awon Idije 1996 to je fifi abuku kan fun ailojutu ati iyaju re - nibi ti idu na ko ni unkankan pato, to kan je pe o gbokan le itara ati ero okan pe eto ilu Athens ni lati gbalejo awon Idije ti ogorun odun; idu fun awon Idije 2004 je yiyin fun inirewesi ati ooto re, iranse re to lojutu, ati ekunrere eto idu re. Idu ti 2004 yanju awon isoro ti ti 1996 ko le yanju - pataki imura ilu Athens, idibaje afefeayika re, isuna re, ati ifoselu se ipalemo awon Idije. Iyorisirere Athens nigba to gbalejo Idije-eye Agbaye Ere Ori Papa 1997 losu kan ki idiboyan ilu agbalejo o to waye na tun se pataki nipa imura re lati gbalejo ere-idaraya akariaye. Eyi to tun fa ti won fi yyan ilu Athens ni itara larin awon omo egbe IOC lati da ogo Olimpiki pada si awon Idije, eyi ni won ro pe o sonu nigba Awon Idije Atlanta 1996 ti won fi abuku kan pe o ti je siseju lokowo. Nitorie, iyan Athens je bi ero pe yio yato si awon Idije 1996. Leyin to ti lewaju ninu gbogbo awon iyipo idibo, Athens segun Rome laini inira nini ibo 5k to dopin. Cape Town, Stockholm, ati Buenos Aires, awon ilu meta miran ti won bo sinu iwe-kukuru IOC, je lile kuro ninu awon iyipo idibo seyin. Awon ilu mefa miran na tun se itoro, sugbon idu won je fifisile latowo IOC ni 1996. Awon ilu na ni Istanbul, Lille, Rio de Janeiro, San Juan, Seville, ati Saint Petersburg. Ni November 13, 2004, ile-ise isoju Greek sediye iye owo ti igbalejo Olimpiki yio na pe o je egbegberunkeji €8.954 (to to egbegberunkeji $11.2 ni 2004) lai ni iye owo ikole ti won ba se nitori awon Idije, sugbon to ni egbegberunkeji 1.08 Euros ($1.35 billion) fun eto abo. NBC Universal san egbegberun $793 fun IOC fun awon eto igbehansode ni Amerika, iye topojulo ti enikan san fun eto igbehansode orile-ede. Leyin isele adaniloro Osu kesan 2001 ideru waye nipa [terrorism|isdaniloro]]. Girisi safikun si iye ti wo na lori abo Olimpiki de egbegberun €970 (US$1.2 billion). Bii awon olopa to to 70,000 ni won so ilu Athens ati awon ibi idije nigba Olimpiki. NATO ati Isokan ara Europe na tun se itoleyin die, leyin igba ti Athens ti toro ifowosowopo lodo won. Nigba ti Igbimo Olimpiki Akariaye fi expressed its concern over the progress of construction work of the new Olympic venues, a new Organizing Committee was formed in 2000 under President Gianna Angelopoulos-Daskalaki. In the years leading up to the Games, Athens was transformed into a city that used state-of-the-art technology in transportation and urban development. Some of the most modern sporting venues in the world at the time were built to host the 2004 Olympic Games. 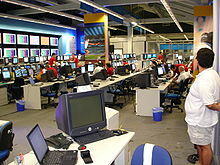 The general cost of the games was estimated to be 7.2 billion euros. 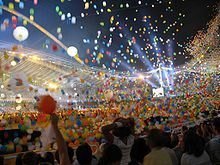 Following the artistic performances, a parade of nations (staged by 5 time Olympic Choreographer Doug Jack) entered the stadium with over 10,500 athletes walking under the banners of 201 nations. The nations were arranged according to Greek alphabet making Finland, Fiji, Chile, and Hong Kong the last four to enter the stadium before the Greek delegation. On this occasion, in observance of the tradition that the delegation of Greece opens the parade and the host nation closes it, the Greek flag bearer opened the parade and all the Greek delegation closed it. Based on audience reaction, the emotional high point of the parade was the entrance of the delegation from Afghanistan which had been absent from the Olympics and had female competitors for the first time. The Iraqi delegation also stirred emotions. Also recognized was the symbolic unified march of athletes from North Korea and South Korea under the Korean Unification Flag. The country of Kiribati made a debut at these games and East Timor made a debut under its own flag. After the Parade of Nations, during which the Dutch DJ Tiësto provided the music, the Icelandic singer Björk performed the song Oceania, written specially for the event by her and the poet Sjón. ↑ 1.0 1.1 1.2 1.3 1.4 "Athens 2004". International Olympic Committee. www.olympic.org. Retrieved 2008-01-19. ↑ Weisman, Steven R. (1990-09-19). "Atlanta Selected Over Athens for 1996 Olympics". The New York Times. http://www.nytimes.com/1990/09/19/sports/atlanta-selected-over-athens-for-1996-olympics.html?sec=&spon=&pagewanted=2&pagewanted=print. Retrieved 2008-09-23. ↑ Rowbottom, Mike (6 September 1997). "Athens wins 2004 Olympics". The Independent (London). http://www.independent.co.uk/sport/athens-wins-2004-olympics-1237761.html. ↑ Longman, Jere (September 6, 1997). "Athens Wins a Vote for Tradition, and the 2004 Olympics". The New York Times. http://www.nytimes.com/1997/09/06/sports/athens-wins-a-vote-for-tradition-and-the-2004-olympics.html?pagewanted=print. ↑ Longman, Jere (1997-08-03). "Athens Pins Olympic Bid to World Meet". The New York Times. http://www.nytimes.com/1997/08/03/sports/athens-pins-olympic-bid-to-world-meet.html?pagewanted=print. Retrieved 2008-09-23. ↑ 6.0 6.1 Anderson, Dave (September 7, 1997). "Athens Can Thank Atlanta for 2004 Games". New York Times. http://www.nytimes.com/1997/09/07/sports/athens-can-thank-atlanta-for-2004-games.html. ↑ "International Olympic Committee - Athens 2004 - Election". Olympic.org. Retrieved 2010-03-15. ↑ 8.0 8.1 "Cost of Athens 2004 Olympics". Embassy of Greece. 2004-11-13. ↑ Crawford, Krysten (August 30, 2004). "NBC Universal rings in Athens profits". CNNMoney.com. ↑ 10.0 10.1 10.2 "Unity Olympics Album". The Star Online eCentral. 2004. http://www.star-ecentral.com/music/sleeve/notes.asp?file=archives/sleeve/2004/5/26/26UnityOlymp&date=5/26/2004/2. Retrieved 2008-08-16. ↑ "Workers in peril at Athens sites". BBC News. 2004-07-23. http://news.bbc.co.uk/2/hi/europe/3920919.stm. Retrieved 2008-08-16. ↑ Associated Press (August 29, 2004). 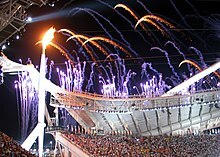 "Master of Olympic Pageantry Prepares One Final Blowout". New York Times. http://www.nytimes.com/2004/08/29/sports/olympics/29closing.html?ex=1148788800&en=1c65a34c3766781c&ei=5070&pagewanted=print. ↑ "SOUNZ - NZ composer - John Psathas". Archived from the original on 2009-08-11. Retrieved 2009-08-07. Àtunṣe ojúewé yi gbẹ̀yìn wáyé ni ọjọ́ 14 Oṣù Kẹfà 2017, ni ago 22:17.